25 things that you should be automating today. Seriously. Humans are gluttons for punishment. We spend our days working through mundane tasks only to repeat the process, over and over and over and over…you get the point. While doing the same thing again and again is entertainment for some, in recruiting it can lead to lost opportunity and missed connections. Focusing on ‘busy work’ rather than talking to that hot sales lead or top talent prospect will eventually impact the bottom line. The problem is, recruiting as a whole has shied away from automation, likely due to the implication that robots can build relationships like humans (they can’t). Automating mundane, daily activities throughout the entire recruiting process can be the key to success. Letting ‘robots’ knock tasks off of the collective lists of recruiters, salespeople and marketers opens up more time to focus on revenue-generating activities. Ultimately, automation assists recruiting and sales leaders adhere to a framework that eases friction inside and outside of the organization. This leads to less time manually entering notes, tasks, email and activities and more time having meaningful conversations with candidates, clients and sales prospects. 1 hour saved per day per recruiter/salesperson equals 260 hours per year, per employee! That’s a lot of hours saved and multiply that by 50 (recruiters/salespeople) and you’re looking at 13,000 hours saved per year! On the recruiting side of the desk, the candidate is king. From new applicants to interviews and on to contractor assignment, there are a number of areas where a forgotten note or missed connection can mean lost revenue and a less-than-sterling candidate experience. With automation, the recruiting ops team can ensure a smooth experience at every step of the recruiting cycle; leaving recruiters to do what they do best – build relationships and put the world to work. Systems like ATS’ and CRMs that depend on human input are also prone to human error. One of these often-missed tasks is updating an applicant status from ‘passive’ to ‘active’. Anyone that is new to your ATS will be updated and ready for future automations or pre-screening. Remind all parties involved on the next step of the candidate journey. In this case, sending a simple email or text to the candidate can ensure an on-time meeting. Also, automatically send a reminder to the assigned recruiter and hiring manager. I just wanted to remind you that your interview with %COMPANYNAME% is tomorrow. If you have any questions please let me know. No one likes being left in the dark, however most candidates never hear anything after they submit a resume. Candidates don’t care if they’re not a fit, they care if they never hear anything.Candidates spend a lot of time putting together a resume and submitting, so at the very least sending automatic notifications after they submit and every time their profile changes can ease the flux of follow-up emails in your inbox. Be proactive and nurture candidates even if they’re not a right fit, right now. Maybe your client is slow to getting back to you and there hasn’t been any progress for a req. Well, if there hasn’t been a note or profile update in a time period, say 2 weeks, you can automatically send a follow-up email to the candidate as a courtesy. Reduce no-shows due to bad directions or info by sending an automatic text message on the first day of a contract assignment (or first day for any type of req). Start the contractor care portion of the assignment off on the right foot by proactively engaging with your now-placed candidate. During an assignment is an often overlooked opportunity to engage with a contractor. Sometimes they may not be ‘feeling’ their placement or some other issue has arisen, by regularly reaching out and assessing their happiness, you can tackle problems head-on and course-correct when necessary (and protect revenue). The first step after a candidate has been chosen for a role is to gather their paperwork. Take the strain out of the process and immediately send an email to HR and the candidate along with any appropriate paperwork. This can all be triggered on a stage of ‘new placement’ or whatever status you use for new hires. Stay on top of A+ candidates and proactively reach out based on their behavior. Using automation to track and notify the assigned recruiter when a Gold Star candidate does a certain action like visits specific job, clicks link in an email or submits an application. When a key stage changes (moving from ‘interview’ to ‘placed’) you can automatically have a notification sent to the recruiting manager or recruiting ops lead so they can predict and forecast placement rates. Email candidates, recruiters, hiring managers, HR or any other important person when key stages change. Very helpful for new hires. Sometimes a field changing should update another. Using automation, you could update a candidate rating to ‘Gold Star’ whenever they have a stage of ‘placed’. This is a big one for certain industries, especially healthcare. Automatically send an email to a candidate 1 month before expiring credentials and every week until new credentials have been received. I just wanted to send a helpful reminder. Our records indicate your %CREDENTIALNAME% is expiring soon and in order to be re-assigned we'll need an updated version on file. If you have any questions please let me know. Always be closing – Alec Baldwin’s monologue from Glengarry Glen Ross said it best. But in today’s sales environment, there are many times when sending emails, following up with new prospects or nurturing current client relationships falls to the wayside. Automating through the recruiting sales cycle can protect revenue, nurture relationships and ultimately close more business. Busy salespeople can overlook a prospect that may have not been ready when they first spoke. Automatically set follow-up tasks to call prospects and keep the relationship fire burning bright. I wanted to check-in and see how our recent placements are performing and help with any of your current hiring struggles. Let me know if you want to hop on a quick chat. Maybe you’ve been working with a prospect for awhile, but for whatever reason they haven’t quite made the switch to customer. Worse yet, they haven’t responded to any of your messages.Luckily, automating email based on a stage change is a piece of cake. For example, moving to a stage of ‘MIA’ or ‘No Response’ can trigger a last-ditch email effort to turn that prospect around. Following up on the status of a recently placed candidate is common-practice, but can slip through the cracks for salespeople working new leads. Set yourself a reminder to call a hiring manager 1 month after an assignment begins and uncover new hiring challenges or address any concerns your client may have. Take it a step further by checking-in each month of an assignment. New prospects, old prospects, lists from conferences – all can be used in a well-crafted email sequence. Automate this first step in building a relationship by sending personalized, plain-text emails to prospects at scale. May seem like a no-brainer, but thanking a new customer and kicking off the relationship isn’t a bad idea. Again, based on a contact stage of ‘customer’ could fire off a welcome packet email with relevant attachments, contacts and info to help your new client get the most out of the relationship. I wanted send along a heartfelt thanks from the team at Nemo Recruiting. We are confident we can help %COMPANYNAME% acheive great success and we've already begun sourcing candidates from our pool of top talent. If you have any questions or need anything whatsoever, please don't hesitate to ask. Ahhhh marketing. It’s a discipline I hold near and dear to my heart. After all, we can think marketing automation for much of what we’ve talked about today. In a staffing organization, marketing has a pretty large responsibility to make sure the candidate and client experience aligns with the brand. From re-engaging with old candidates, aligning touchpoints to the brand and generally helping recruiting and sales teams send right content at the right time, marketing has its hands full. Luckily we have automation to help. Sounds like a no-brainer, but it happens over and over again – applicant submits application and never hears anything. Ease the friction right from the start and respond once an application is successfully submitted. Thank you for your recent application! We will be reviewing all of our submissions soon and will update you throuhout our recruiting process. In the meantime, here are some other positions that you may find interesting. It happens. Thousands of candidates get sourced, 2% get placed and the rest just settle in the ATS for a long nap. Stop this by identifying and communicating with old, but not awful candidates (and clean up your ATS while you’re at it).Send regular email to old candidates – typically those without a note or other activity in 6 months – Herefish customers see an increase in placements from existing ATS candidates of 76%, so reinvigorating current ATS candidates pays off. A players know A players, or so the saying goes. Capture more value from your current ‘top talent’ by driving referrals. You can base a referral email simply on assignment end date or go one step further by using a candidate score to find your most engaged candidates. You have been a great contractor for us and I just wanted to pass along a big THANK YOU from our team. Quick question; would you be open to referring like-minded friends of yours? You'll earn $1000 if we place a referred contact, how does that sound? If you have anyone in mind, please let me know. Weed out bad information automatically and clean up your database. Candidate and prospect info can be entered incorrectly or simply be bad. Using automation you can identify these records and attempt to update or simply remove them from your system. Retail outlets have used this for years but it’s just as applicable for recruiting. Sending an email on a specific date like a birthday or customer anniversary is a small delight that can be set once and will run forever. You've just done another trip around the sun at 67,000mph - that's fast! From the team at %COMPANYNAME% I just wanted to say HAPPY BIRTHDAY!!!!! Systems that aren’t integrated require endless downloading and uploading of spreadsheets. 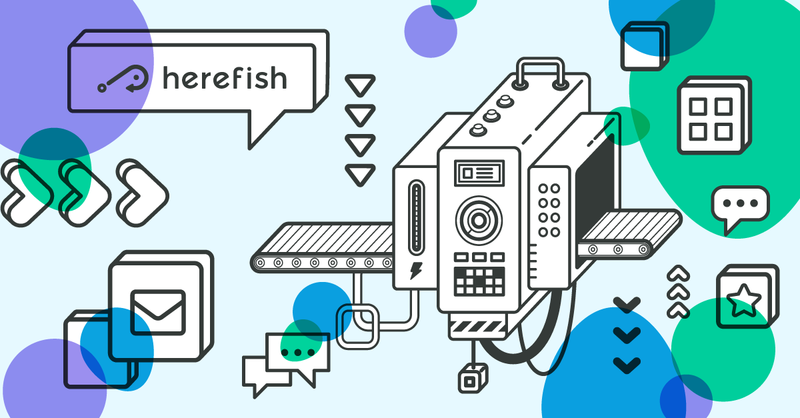 Stop this insanity and automatically keep your marketing platform, like Herefish integrated with your ATS and never upload a spreadsheet again. So there you have it; 25 things that recruiting automation can help with today. Automating repetitive or mundane tasks that are prone to be forgotten help recruiters, salespeople and the entire organization save time, money and effort. The Recruiting Industry Is About to Automate – Are You Ready?